Finally we know where the beef is: inside our amazing Herbed Beef Sliders. One taste and it’ll be clear – it’s where beef was meant to be. And it’s probably what our Potato Rosemary Loaf was meant for – well, that and eating it straight out of the bag. If you think the tomato, spinach, tangy mayo, and red onions make it sing, wait until it’s sandwiched between two slices of Potato Rosemary! Try to keep this recipe under wraps lest it monopolize every BBQ in America. Mind you, steaks, sausages, and chicken have had their turn in the limelight, now it’s our turn. Slice bread and toast in oven or on the top rack of the grill. Place ground beef in a large mixing bowl and combine with olive oil, garlic powder and parsley. Use your hands to gently mix ingredients together. Form patties about the size of your bread slices and cook on a hot grill until cooked through (approximately 6 minutes per side). Remove from grill and build sliders. 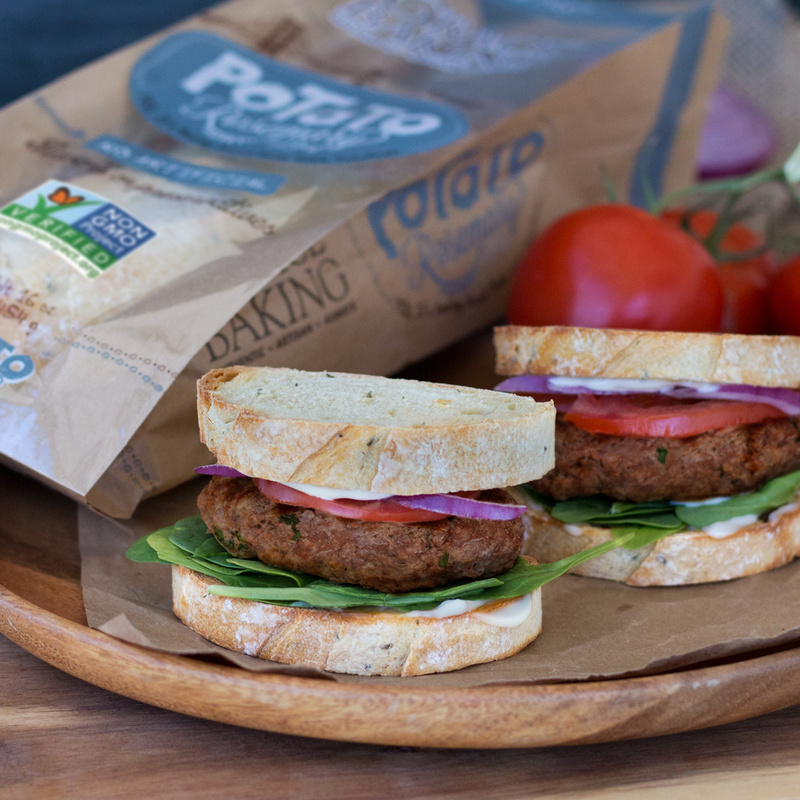 Spread light mayo on half the toasted bread slices and top each with spinach, burger patty, tomato, red onion and remaining bread slices.